The little man loves crafting almost as much as he loves toys. 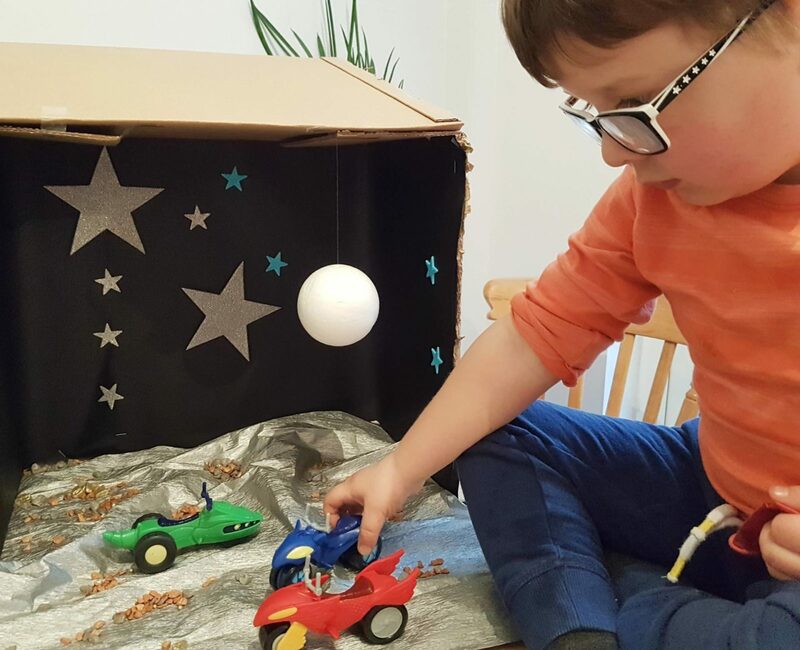 Having recently been sent some of the fab new PJ Masks Super Moon Adventure toys and a bundle of craft goodies, we decided to combine his two loves and create a homemade Super Moon background to encourage imaginative and more creative play with his new PJ Masks toys. 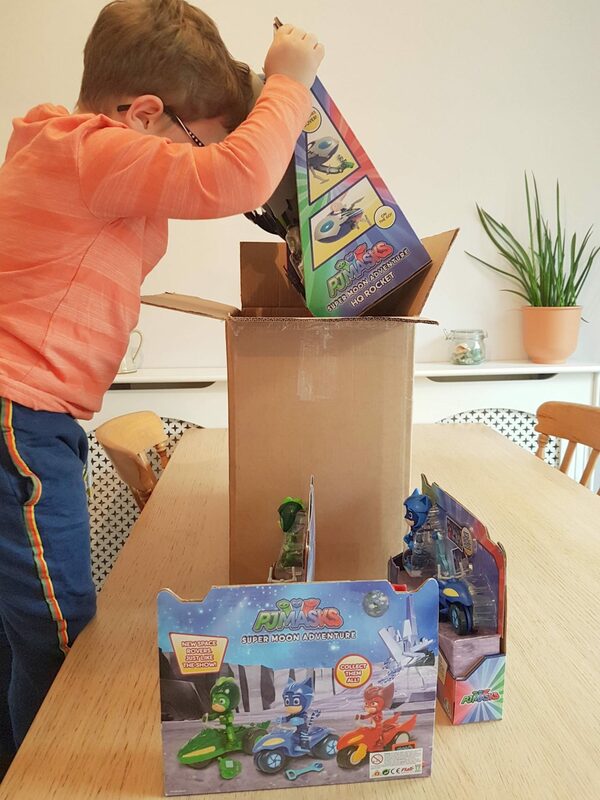 First out of the box was the PJ Masks Super Moon Adventure HQ Rocket. 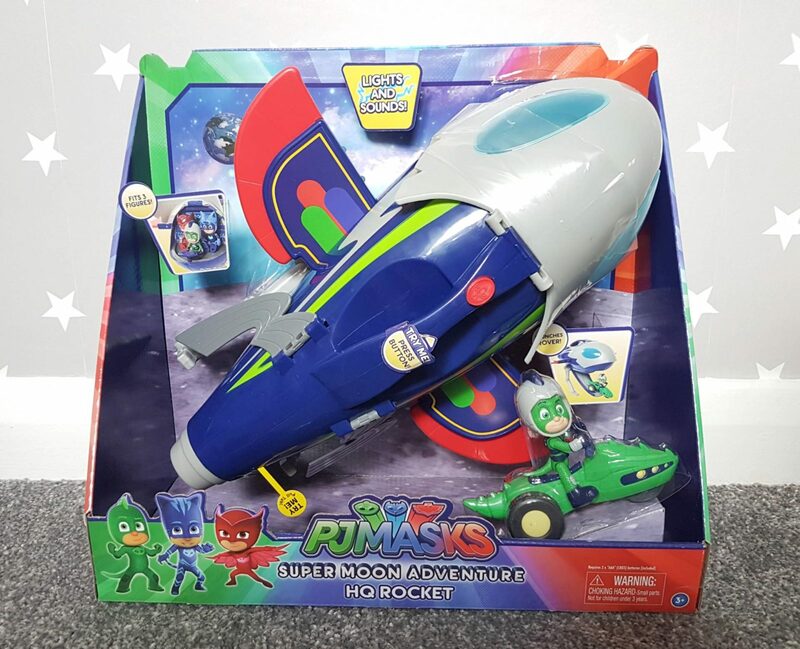 Available to buy at Argos, it’s a new design inspired by the PJ Masks TV show. 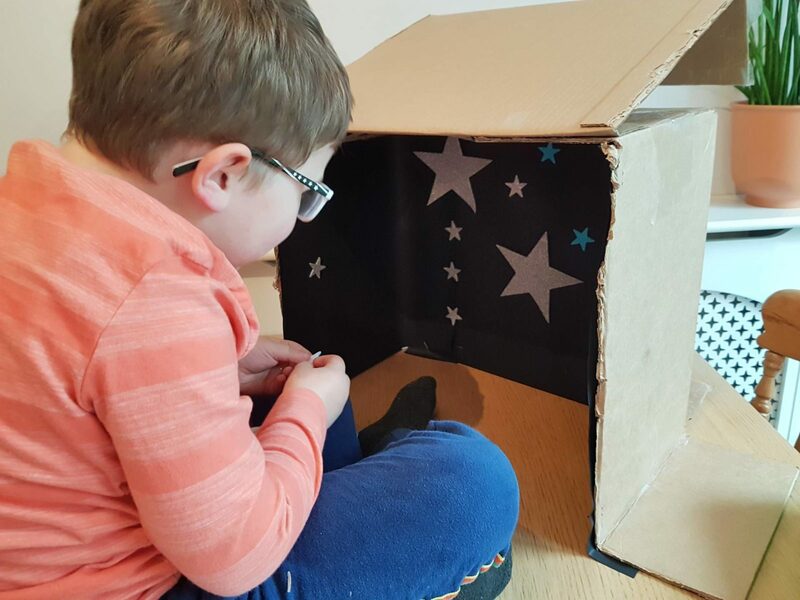 It’s a decent size and even has working lights and sounds which is always a hit with the little man. 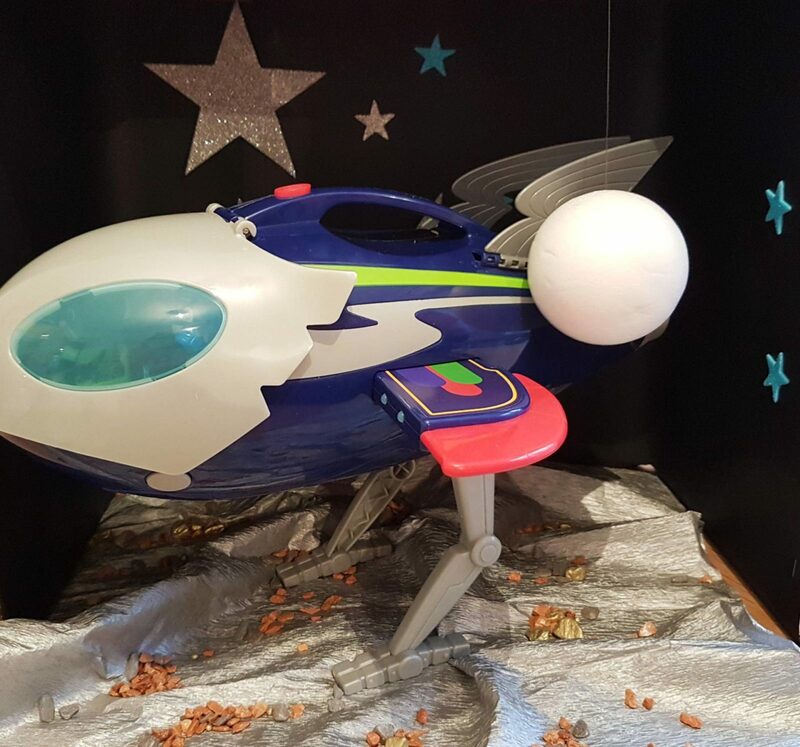 The HQ Rocket has a carry handle on the top which makes it easy to carry around for small people ( or fly round the room if it takes your fancy). There’s a red button on the top too which makes the lights work and plays sounds from the TV show, including the theme tune. The rocket has foldable legs and a ramp that opens and closes. Included in the box is Gekko and his space rover vehicle which can be pushed up inside and launched from the HQ rocket. The little man also received Catboy, Owlette and Gekko who each come with their own Super Moon Adventure Moon Rover. They’re the perfect addition to the HQ Rocket but can be played with by themselves too. They retail at £9.99 each and are a great pocket money price toy. Each figure is 7.5cm tall and is nice and chunky, making them perfect for smaller hands. The figures can sit on their own moon rover, and hold on to the handles at the front. 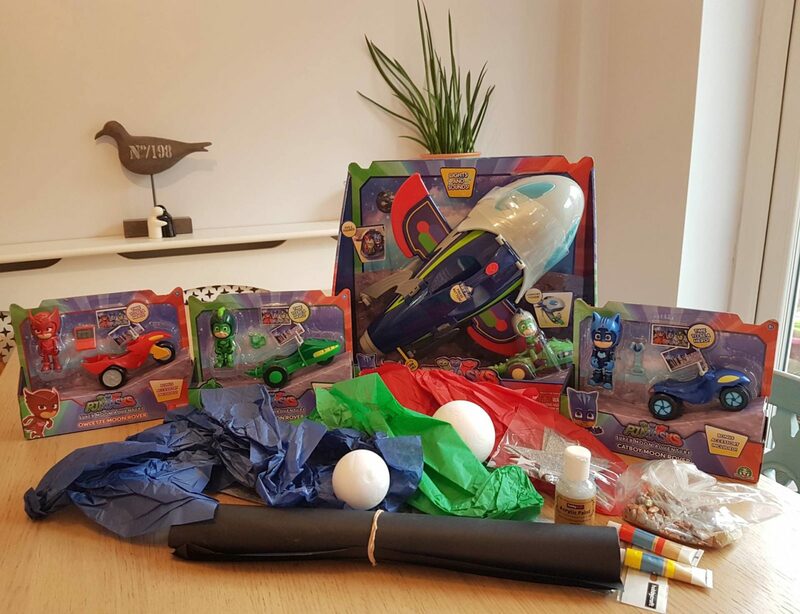 As well as the fab new toys, we were kindly sent a great selection of craft products to help with our craft task. 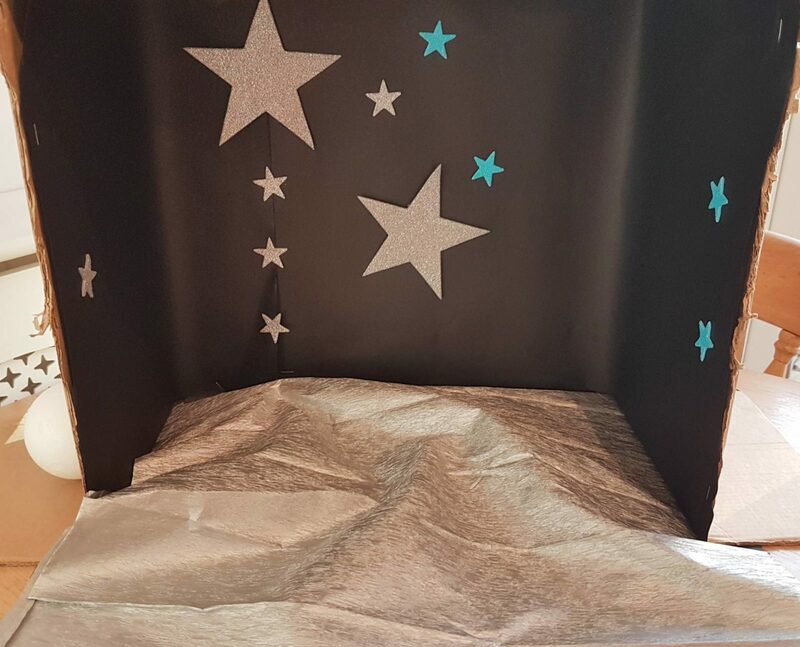 We decided to make a simple background using the cardboard box that his toys came in. Hubby cut off the front of the box, making it looks a little bit like a mini theatre – think Punch and Judy! Then they used black paper to line the insides of the box. making a night time scene. 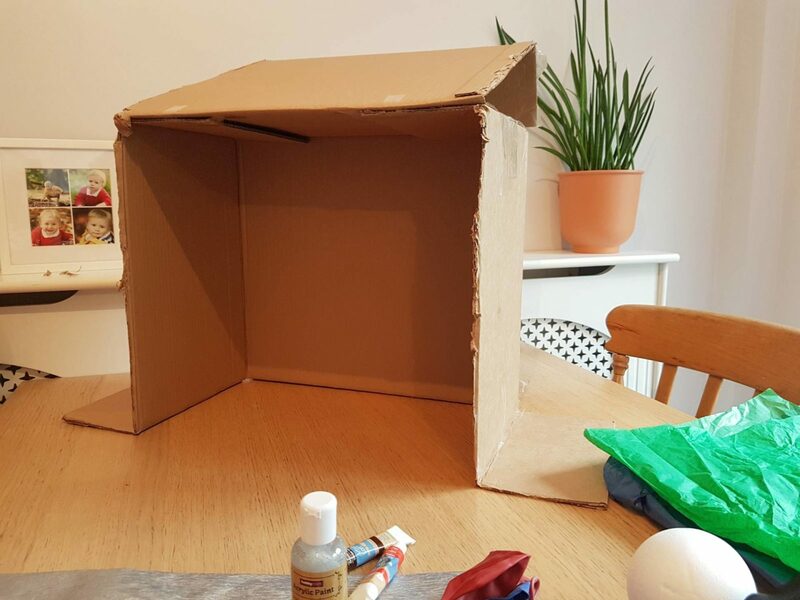 You could paint the box if you wish but if you have an impatient child like mine who can’t wait for paint to dry, you might want to consider the paper instead. 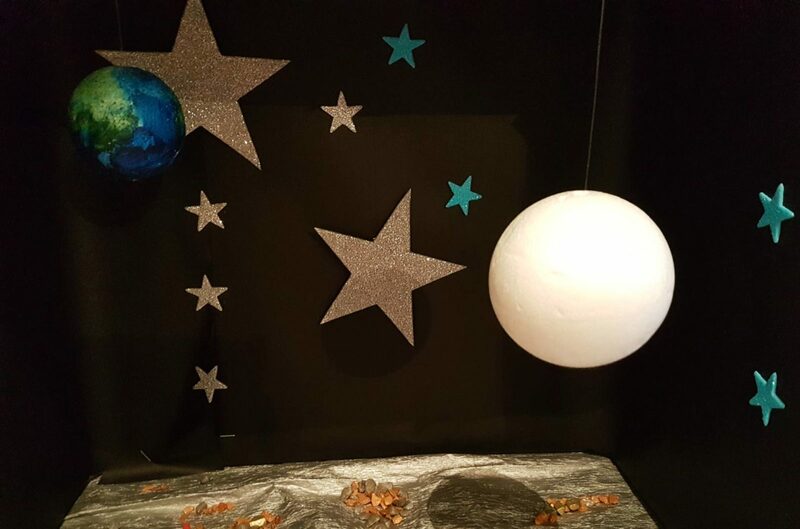 Once we had a black background secured, the little man stuck on a variety if sparkly star shapes to make it look more like the night sky. Next up we created a floor that looked like the floor of the moon. We used silver crepe paper but I think tin foil would also have a good effect. 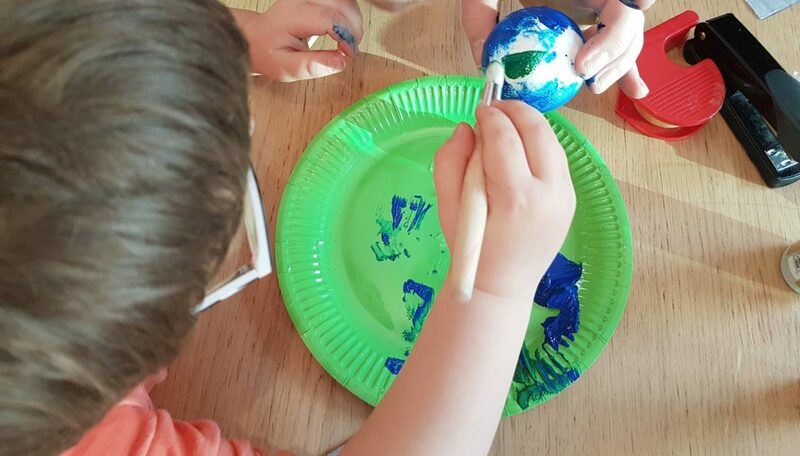 The little man then painted one of the Polystyrene spheres to look like the earth and left one plain white to look another moon. 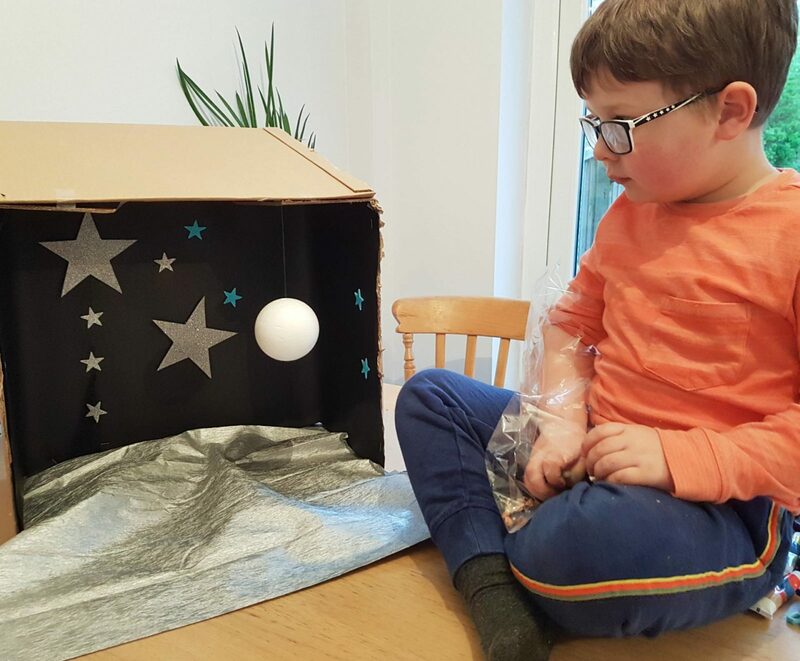 Ddady then pierced the top of the box and the sphere with a thin screw driver and used the invisible thread to hang up the moon and the earth. 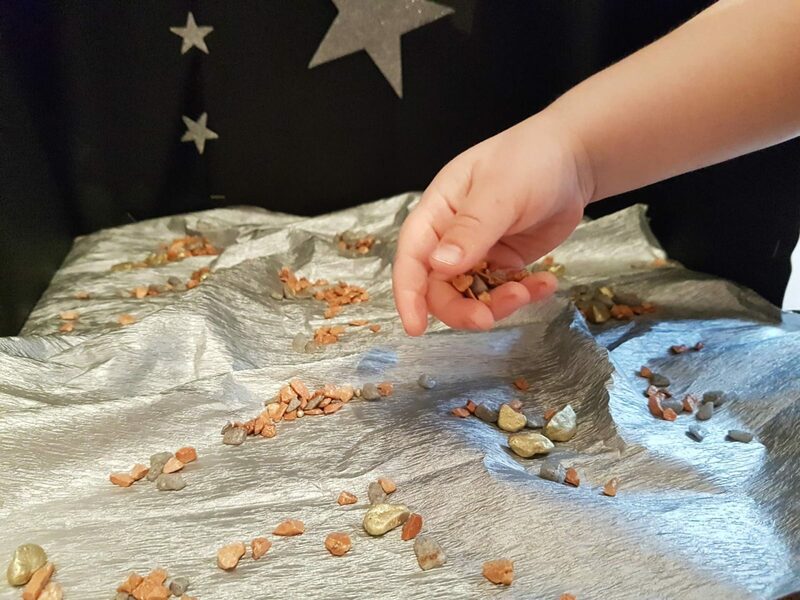 The little man strategically placed his metallic rocks on the moon surface to create the look of craters. 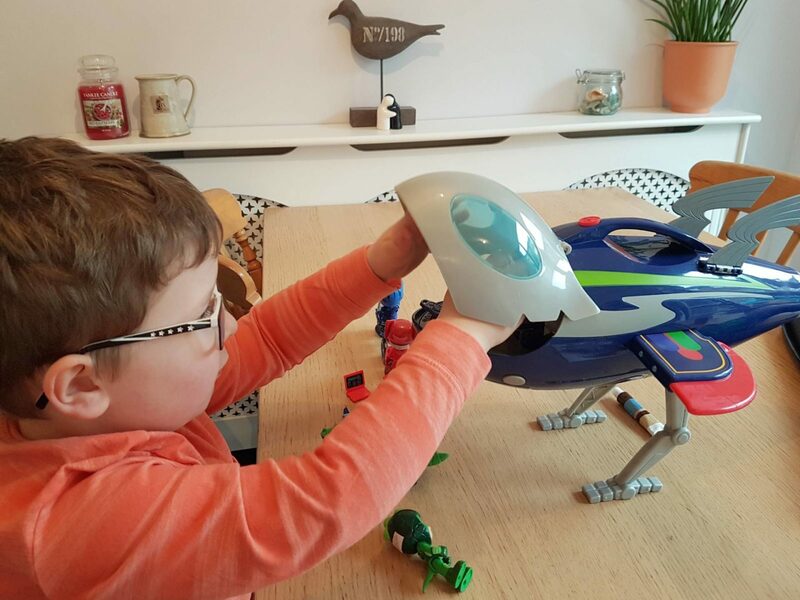 The background became the perfect place to play with his new PJ Masks toys and something that now lives on our kitchen table! 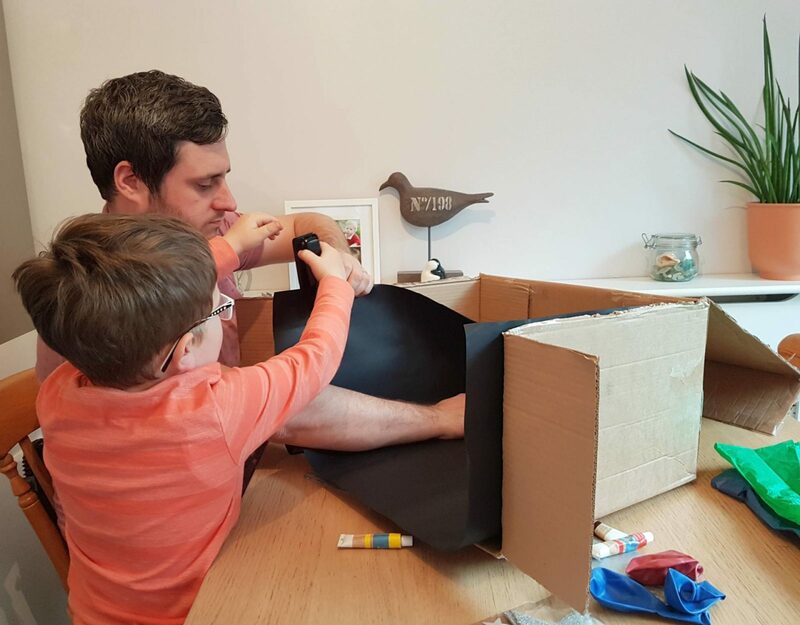 I don’t know why we don’t make things like this more often, it increases the longevity of play for toys and encourages the little man to be more creative. 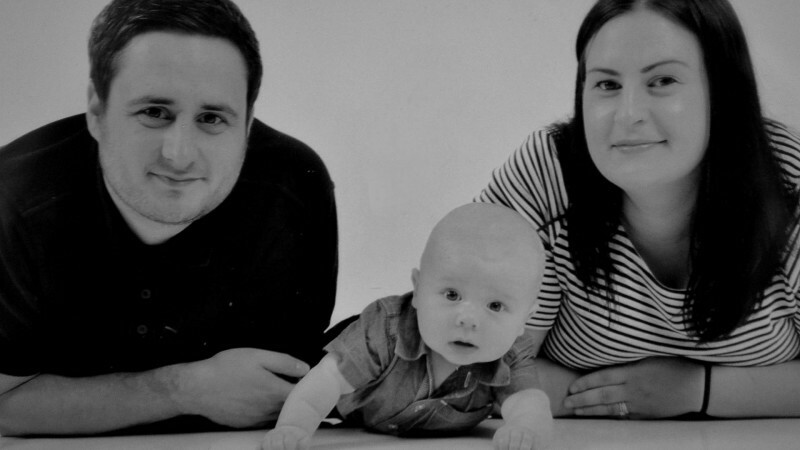 He absolutely loved creating the background and it could do without too much assistance. 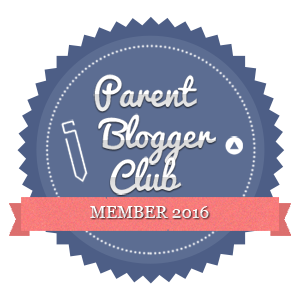 We were sent the products included in this post for feature and review.